By lowering the temperature, the partial pressure of a gaseous component in a carrier gas is reduced to such an extent that it condenses. In the flow sheet, CS2 condensation as used in the viscose fiber industry is shown in simplified form. 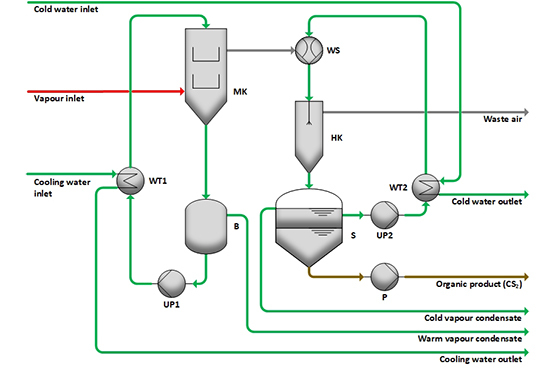 During viscose fiber production, exhaust air flows are generated which mainly consist of water steam, air and CS2. In the mixing condenser MK, the main amount of water vapour is first condensed with circulating cooling water. CS2 is not yet condensed due to the prevailing temperature. The non-condensed materials are sucked off by a water jet apparatus WS. In a downstream secondary condenser HK, CS2 and water steam is then condensed by cold water at a lower temperature. In settler S, the mixture then separates into two phases and can be sucked off. For solvent recovery, even with explosive substances. Saving of cooling energy in the chilled water circuit through double-stage condensation.